We've all done it. Spritzed on a perfume we thought we would like ... or gone a little spray happy with a perfume we already knew we liked ... and then what happens? We end up smelling terrible. I've experienced both of the afore-mentioned traumas in the past week, and let me tell you -- I really don't know which is worse. Whether I'm smelling a terrible perfume (at the time it was the new one by Victoria's Secret, Wish) or realize I went a bit trigger happy with one I actually like (such as Jo Malone Red Roses Cologne), it's really not fun to sit in a cubicle hating the way I smell all day. But luckily, the lovely Heather from M.A.C and I came up with a solution. When I told her about how horrible Wish was and how I couldn't stand it being on me all day, she immediately came to the rescue with an absolutely ingenious notion. "Why not rub some M.A.C Wipes on your skin to get rid of the smell?" she asked. GENIUS! Meant to be used as makeup cleanser, these wipes came to the rescue immediately. A quick rub over the offending area and I was good as new within seconds. Literally, the scent was gone. To put this experiment to the test yourself, head to M.A.C's website and pick up your own pack immediately. A bulk pack of 100 sheets is $25. 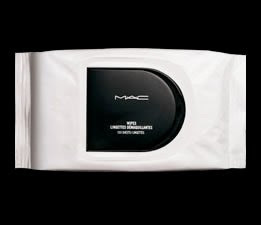 Do these wipes have something special in them, or will any type of makeup wipes do the trick?